All the links to the 2010 Open LFB game reports can be selected from the drop down menu. 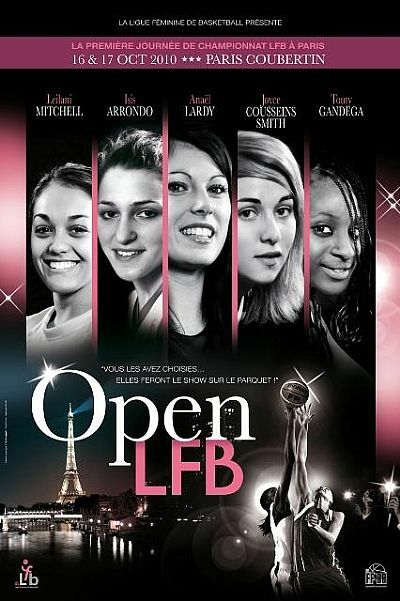 The five players on the poster for the Open LFB were chosen during an internet web vote conducted at the end of last season. Leilani Mitchell, Isis Arrondo, Anaël Lardy, Joyce Cousseins-Smith and Touty Gandega who will all be present and playing during the opening day. Cathy Melain, Arnaud Guppillotte, Didier Servant, Thierry Moullec, Fabrice Canet and Ivano Ballarini. You can watch all the action live on our WEB TV page. The format of the event remains the same with four games on Saturday and the remaining three games on Sunday. For the first time at the Open LFB the best player in each match will be awarded a player-of-the-match trophy. All through the weekend various presentations are made: Leilani Mitchell and Alexia Plagnard will be presented with their player-of-the-year awards. Bruno Blier from Arras will pick up his coach-of-the-year award. The France U16, U17 and U18 teams will also be presented to the spectators.